A murderer doing time in Hell. A girl who just wants to win her high school band contest...no matter what it takes. Sumo wrestlers with a supernatural secret. A future Tokyo where vampires are menial laborers nursing long-held grudges against humanity. And even a very conscientious, if unstable, Universal Transverse Mercator projection. These crime and mystery stories from and about Japan explore myth, technology, the sharpness of a sleuth’s mind, and the darkness in the hearts of criminals. Read these stories and learn that hanzai means crime! 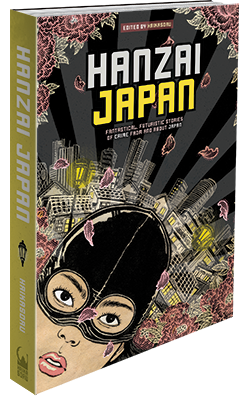 HANZAI JAPAN table of contents and cover reveal! Every time I come to Washington it rains. I don’t know why this should be, but my father used to tell my brothers and me that there’s no point in denying reality, even reality that’s ridiculous. Rain fell insistently, tracing diagonal lines across the windows, as the Acela train Bill Smith and I were riding pulled into Union Station. We swung our overnight bags down and beat it to the subway. In Washington they call it the Metro and it runs on rubber wheels, and in the place we came out, Dupont Circle, it had a huge sci-fi escalator to the street. “You think we’ll be on Mars when we get to the top?” I asked as the gray sky in the round opening came closer. I lofted my umbrella, Bill sunk his head in his raincoat collar, and we splashed the two blocks to the row house where Moriko Ikeda lived in an apartment on the parlor floor. As I told Bill, Moriko and I have been close since high school. We went to Townsend Harris in Flushing, Queens, which is stuffed full of brainy Asian kids but, as my brother Tim never lets me forget, isn’t Stuyvesant. My four brothers and I all went to high schools you had to test into, but different ones. Tim was already at Stuyvesant when my tests came up; I didn’t even fill out the application. Why? The different-schools thing hadn’t applied to elementary school. I was the youngest—and a girl—and I followed my brothers all the way through Sun Yat-Sen in Chinatown. I couldn’t wait to get to a school where, when anyone asked if I was related to such-and-such a kid named “Chin,” I could say I wasn’t, not just wish I wasn’t. Moriko and I hit it off from the beginning, even though the Chinese and Japanese kids mostly eyed each other with suspicion (and the Koreans eyed both of us that way, and the black kids eyed the Latino kids that way, and the white kids were too stunned by finding themselves in the minority to do anything but huddle together for warmth). With me and Moriko, maybe it was an opposites-attracting kind of thing. I was a short, straightforward, practical jock; she was tall, elegant, sweet, and spacey. Never this spacey, though. She’d called yesterday to ask me to come to Washington as a last-ditch attempt to solve her problem, which was: a man had stolen her kitsunebi, and since she’d die without it, she had to do what he wanted so he’d give it back. Kitsunebi is the soul of a kitsune, a fox spirit, and in this case what the man wanted was for Moriko to marry him. Moriko buzzed us in within seconds of my pressing her doorbell. We’d stepped into the building’s small entry hall and I was folding my umbrella for stashing when she opened the glass-paneled inner door. Her eyes lit up when she saw me, and I’m sure mine did when I saw her. Bill’s eyes I didn’t look at because I didn’t want to know. You have to understand: Moriko is gorgeous. She’s not actually super tall, maybe five-ten, but she’s so slender that she gives a long-limbed, languid impression. She seems not to walk so much as flow, and the shoulder-length hair framing her narrow, high-cheekboned face is as black and glossy as her skin is pale. I’m always surprised when I find myself explaining something to Bill. As he’s pointed out more than once, I’m the Asian person in our relationship. But he, rumpled, antisocial, and blue-collar as he appears—though not today; today he wore a sharp navy suit with a white shirt and blue-and-silver tie—is the one with the deep background in art, music, and all kinds of culture, including Asian culture. So long before Moriko hired us, he’d heard of kitsune; but apparently he wasn’t familiar with their fine points. I was, because I’d looked them up. For example, they’re usually called “fox spirits,” but that makes them sound like ghosts and they’re not ghosts. They’re regular foxes who’ve reached a great age and attained wisdom and magical powers. Like shapeshifting. Into old men, young girls, and beautiful women. For another example, they carry their souls, their kitsunebi, outside their bodies in glowing globes of fire. In fox form, they hold the globes on their tails. When they’re humans, where to keep the globes—the kitsunebi-dama—becomes problematic. And it seemed that Blake Adderly, up-and-coming young hotshot D.C. power broker, had, in the course of dating Moriko, discovered and walked off with hers.